The series kicks off with the story "Souichi's Convenient Curses", which it marks as number 068 in the Collection. It follows the eccentric Souichi Tsuji - a loner schoolboy who takes pleasure in cursing his classmates for the pettiest of reasons. Souichi is also the black sheep of his family, and prefers to spend his time tormenting his older brother and sister in any way he can. 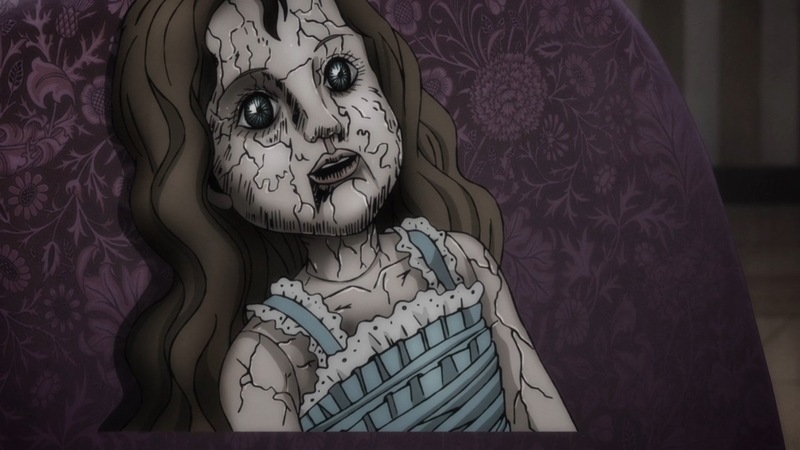 The story is briefly followed by "Hellish Doll Funeral" (number 090), which in two short minutes follows a mother and father whose daughter has been transformed into a doll and continues to deteriorate into a twisted nightmare. 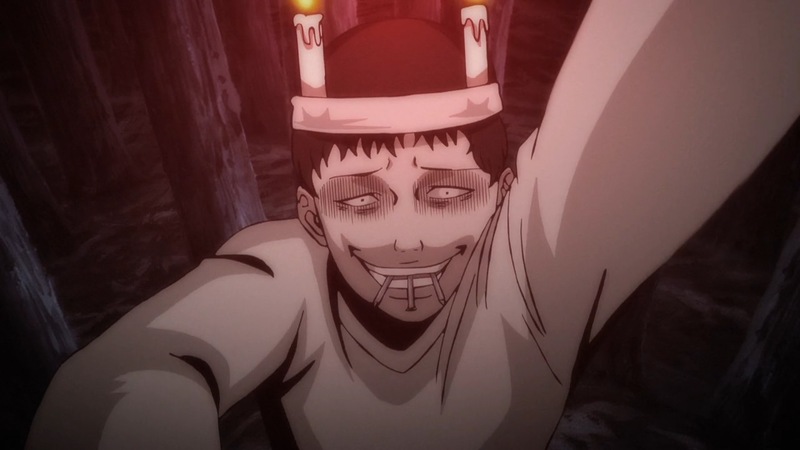 Given Ito's reputation and the promotion behind this series I'm sure many (including myself) expected the Junji Ito Collection to start with something a little more harrowing, rather than a rather silly tale of a twisted boy with delusions of grandeur. The relatively slow pace and often slapstick nature of the story might be enough to instantly deter people, but the whole thing was just oozing with character. 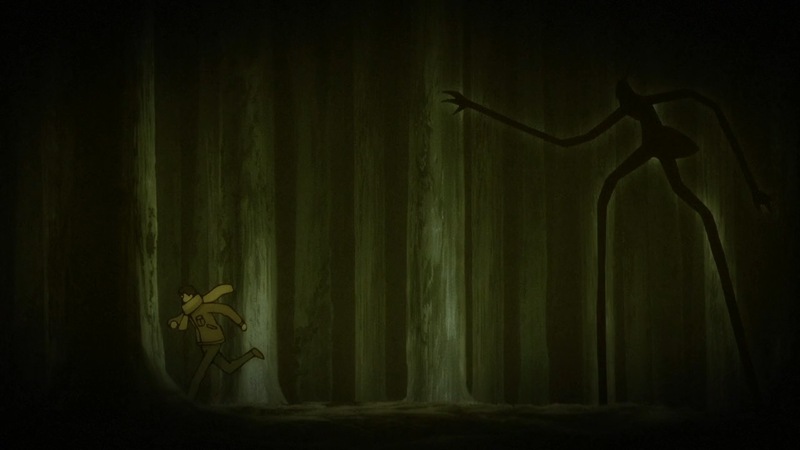 This partly came down to the visuals, which imitated Ito's art style recognisably enough to give the production it's own unique flavour. The character of Souichi was also strangely appealing - a snivelling toad of a boy who in any other circumstances you'd probably want to see get their comeuppance but here you can't help root for as he torments and curses people in the dumbest of ways. However there is a quite obvious struggle as the story repeatedly tries to portray Souichi as this creepy kid that by all accounts should make you feel uncomfortable, but is constantly outdone by his ridiculous actions. He isn't really the kind of character that makes a good first impression for a horror anthology, and though I got a lot of an enjoyment out of him can understand why he might have been better saved for later in the series. Meanwhile "Hellish Doll Funeral" was exactly what most people tuned in for, but despite giving the episode a much needed dose of graphic horror wasn't really long enough to create anything other than a brief moment of interest. Both its placement and structure made it feel more like a next episode preview than a full story, especially as the only dialogue in the whole thing was expository. The final shot is strong on its own, but would have had so much more impact had the show delivered the story behind it as well. Where did the curse come from? 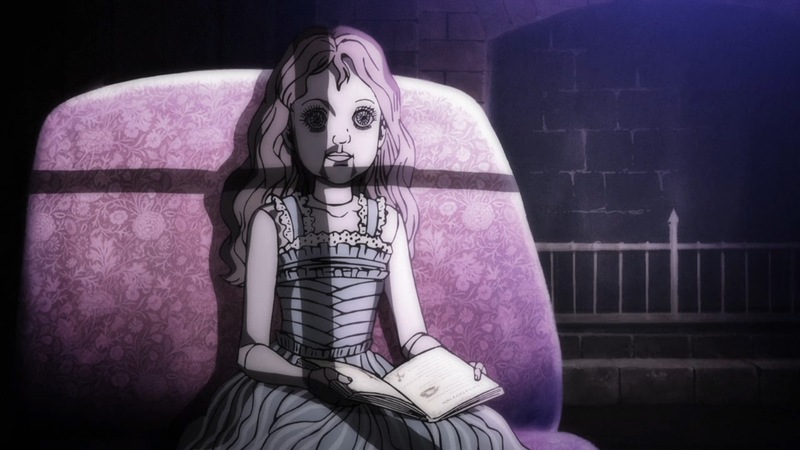 How fast (and disturbing) was the daughter's transformation into a doll, and than again into a writhing nightmare. As a standalone piece "Hellish Doll Funeral" feels like something for existing Ito fans who now get to enjoy the novelty of seeing these pieces animated, rather than something equally accessible to newcomers. That said, if the original manga has that missing impact then it might inspire more to seek out the originals anyway. I for one can say I'm interested after seeing this. The Junji Ito Collection has gotten off to a pretty interesting start, even if it's the start that no-one really had in mind for the series. "Souichi's Convenient Curses" was more twisted silliness than true horror, while "Hellish Doll Funeral" simply wasn't long enough for it's impact to be properly felt. However the bleak colours and great art direction give the series a distinct identity that conveys the source material nicely, so hopefully this will be enough to carry viewers on to some of the darker stories yet to come. The trouble with an anthology series is that not everyone is going to be a winner, so time will tell just what this show still has in store.